About a mile and a half from where I live, on a main road, there is a little place that sells cheeseburgers, french fries and milkshakes. I mean the food at this place is delicious. Every time I drive past it, my brain really wants to stop there for a meal. It's tempting. This is where having a spouse comes in handy. I will forget my age for a good cheeseburger. My bride will not. Apparently, we are not the only ones currently driving past Shake Shack (SHAK - Get Report) locations these days as we go about our business. SHAK reported its third-quarter Thursday night. You may have been waiting on Apple's (APPL results at the time, so perhaps you did not notice. SHAK beat expectations for both EPS and revenue. The bad news? Same-store sales decreased. That's right... -0.7% versus a projected +0.9%. How does consensus miss the mark that badly, unless every one is copying someone else's homework. If this was fifth grade back in the day, the nuns would have had a field day. The firm has also guided toward a few less new store openings than had previously been planned, but actually raised its corporate outlook for full-year revenue (but still below the questionable industry consensus). Needless to say, investors did not only flee this name overnight, they have been in flight since early Summer. 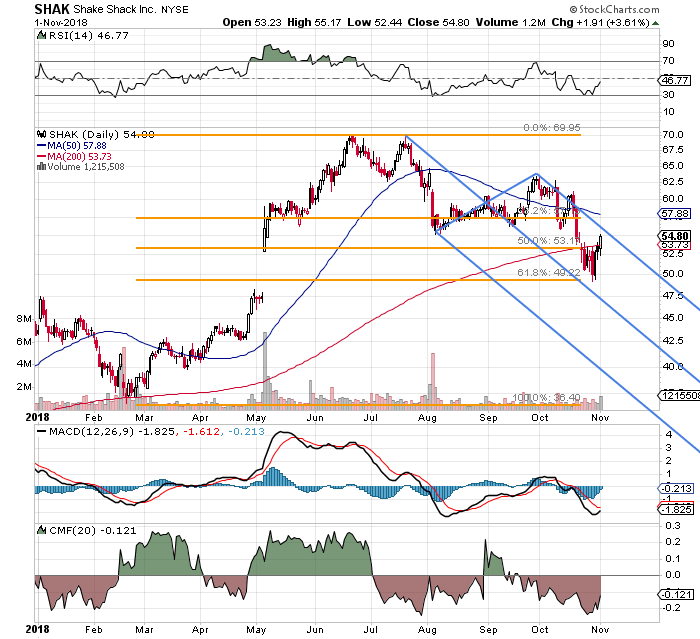 What screams out from this year-to-date chart of SHAK is the strict technical obedience that this stock has shown to both a 61.8% retracement of the February-through-June move higher, and the recent upper chamber of the downward-sloping Pitchfork model. Given that this name is off more than 5% overnight, it becomes difficult for me to price options' premiums for you in the wee hours of the morning. I will tell you this, however. I think the stock is too expensive in relation to sales. Way, way, way too expensive. I would have loved to have gotten short this name this week, but I'm not that sharp. What I can still do, in a risk-controlled way, is get long what is known as a "bear put spread." In a Utopian world, I would like to purchase $50 puts expiring the third week of December, while writing $42.50 puts of the same expiration. If the underlying equity adheres to my Pitchfork, this trade is doable. --Write $42.50 puts of the same expiration. The trader would be at risk for the net debit paid on the premiums. That's the worst case. Max revenue on these positions would be $7.50. My thought is if I can put this trade on for $3 or less, for me this becomes worth it in terms of the risk/reward. Otherwise, I'll find something else to do Friday morning. At the time of publication, Guilfoyle was long AAPL and short AAPL puts.